Neptune appears in this natural color composite as a pale blue disk (similar to Cassini's image of Uranus from 2014, see PIA17178), just below and to the right of image center. Most of the faint specks in the image are background stars, although some are likely cosmic rays (charged particles that strike the camera detector). 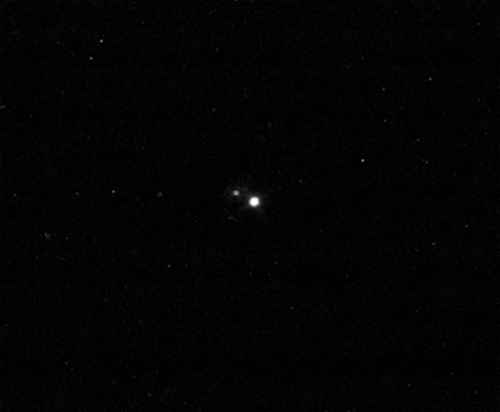 A cropped and magnified version (Figure 1) is provided in monochrome with Triton visible as a point of light above and to the left of Neptune. In imaging Neptune, Cassini's solar system family portrait-taking is complete. The mission's planetary photojournal includes all of the major planets except Mercury, which is too close to the Sun to be imaged, as well as dwarf planet Pluto. 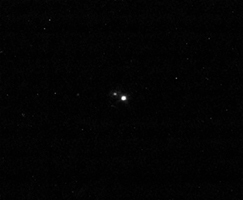 This view was acquired by the Cassini narrow-angle camera on Aug. 10, 2017, at a distance of approximately 2.72 billion miles (4.38 billion kilometers) from Neptune. Red, blue and green filter images were combined to create the natural color image.